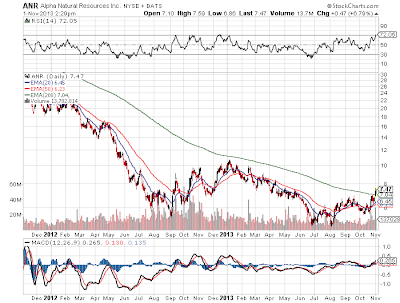 Even after reporting further loses and weak pricing in the met coal market, Alpha Natural Resources (ANR) has formed a beautiful chart. Won't ever claim to be a technical expert, but this chart shows consolidation for a year and an eventual rise above the 200ema. When a stock starts breaking above the moving averages and the news isn't overly bullish, its a good sign that the momentum has turned in the stock. The sellers are done for the time being. Everybody needs to remember that Alpha Natural has very significant and valuable met coal assets. At this point, its just a matter of rationalizing supply and demand to get prices higher. These resources will be valuable again at some point. Another quarter and the user metrics at Zynga (NASDAQ: ZNGA) continue to slump.The good news for the social game producer is that the company easily surpassed estimates on bookings and revenue, providing a level of comfort that the slide is coming to an end. The new CEO Don Mattrick hasn't so much produced new games as he has instilled confidence in the future. Last quarter, Don outlined enormous future growth on mobile platforms that unfortunately other public game producers aren't reaching either. Massive game publisher Electronic Arts (NASDAQ: EA) and small developer Glu Mobile (NASDAQ: GLUU) have both struggled to capture significant market share from the future platform of gaming. Disclosure: Long ZNGA and GLUU. Please review the disclaimer page for more details.